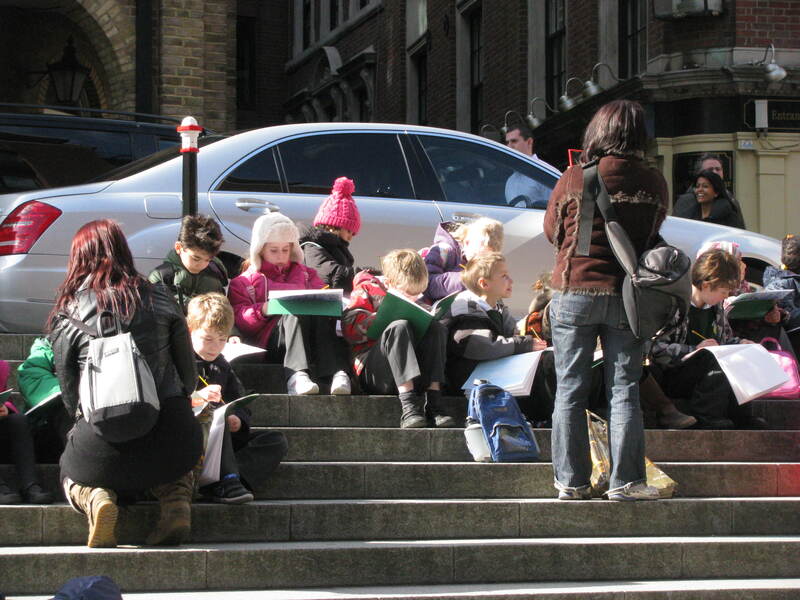 Children sketching. But of what? . It seems that I keep noticing the Shard now. Months ago I didn’t know the name of the pyramid in the sky. A sand couch? Not sure what this guy is up to. Oh no! 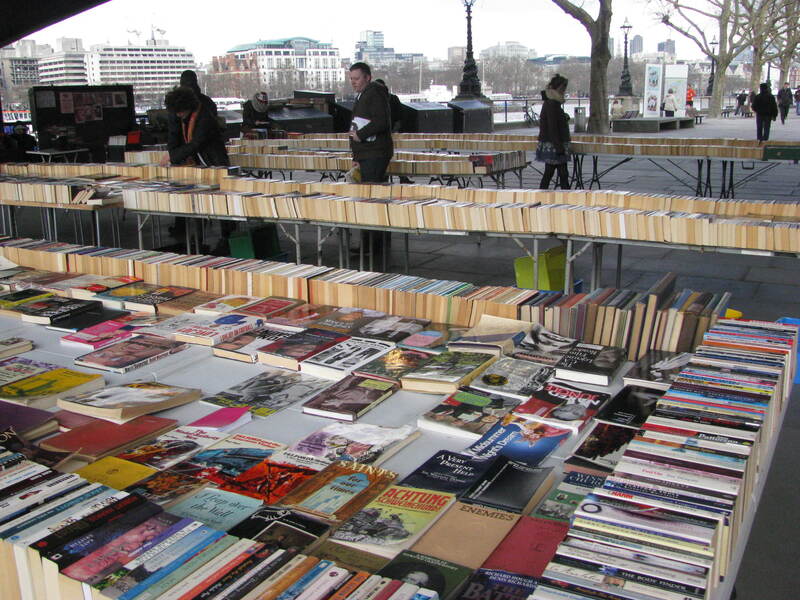 Books outside of the B.F.I. A lot of books. I resisted yet again and didn’t buy any. It helped that I didn’t have any cash. Near the B.F.I .there’s this graffiti. 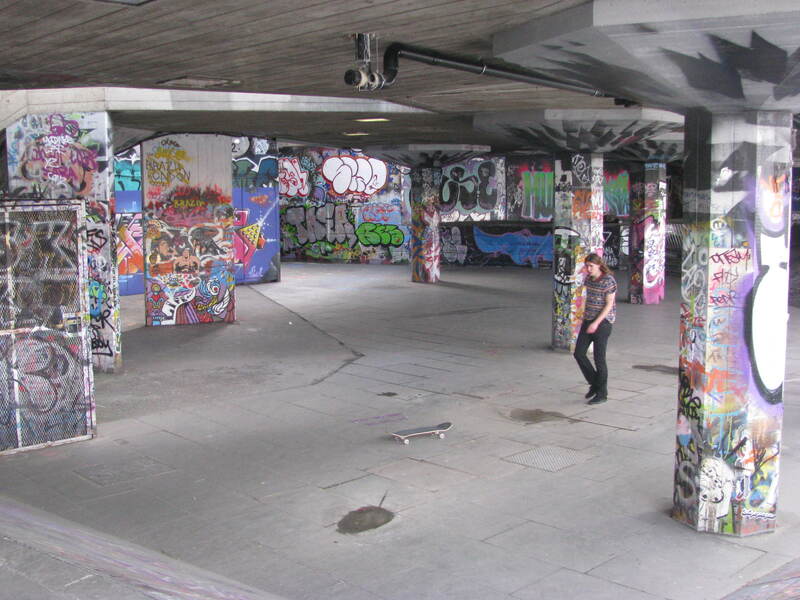 It seemed like a popular spot for skateboarders. It has been years since I tried that. Whilst crossing Hungerford Bridge I looked over the side and saw these broken skateboards on one of the supports of the bridge. Unfortunately I had to get back to work so I hopped the Tube and headed home. I wonder what I’ll find on my next stroll. This entry was posted in Blog, Blogging, England, London and tagged BFI, City Life, England, Graffiti, Hungerford Bridge, Life, London, Photography, Photos, Red Bull, River Thames, Sand Art along the Thames, School Children, Skateboarders, St. Paul's Cathedral, The Shard, The Tube, Travel, Travel Blog, Travel Journal, Travel Photos. Bookmark the permalink. Lovely pictures! Looks like a fun little afternoon adventure! It was a great stroll. I wish I had more time to just wander and explore. Check out my Link of the Day – I think you’ll like it! I mentioned your blog also. Loved the link and thanks for mentioning my blog! 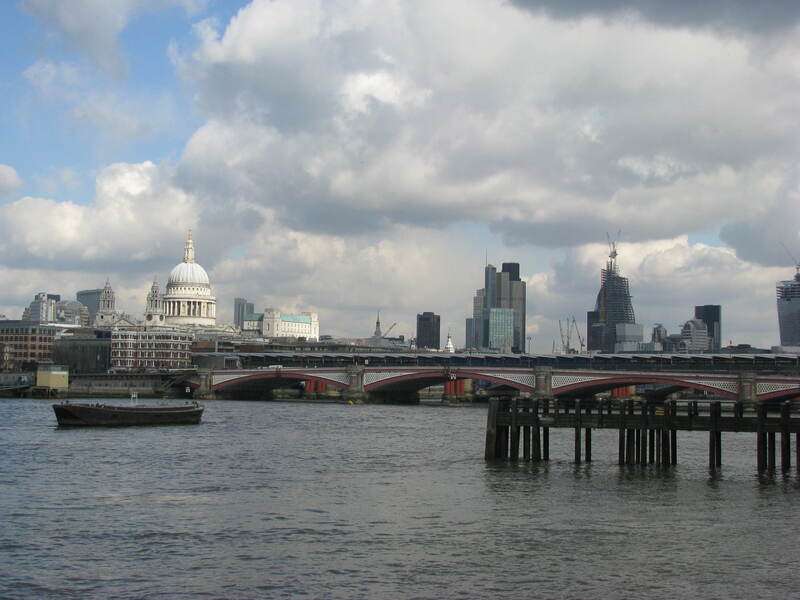 Love these pictures of London! I lived there 3 months on a study abroad trip and I absolutely loved the “nontouristy” stuff like this! It’s amazing how diverse the city is. yes there’s the normal, but you don’t have to look too hard to find the unusual. It’s everywhere. Agreed! I think sometimes in the daily things we do we find the most unusual, we just don’t always realize it. Love this and reminds me of when I used to live there…. thank you! I’m also shocked by some of the things I see every day here on my walks with my dog. Glad you enjoyed your memories. This is a wonderful place to live. I’ve been here over a year but I still feel so new to the city. Beautiful pictures! Really, really hope to visit sometime! Love these strolls through London. Makes me want to hop on a plane right now. You’re so lucky to be living there! I wish I knew why he was doing it. for fun? Promotion? I would guess promotion because of the words ‘red bull’. 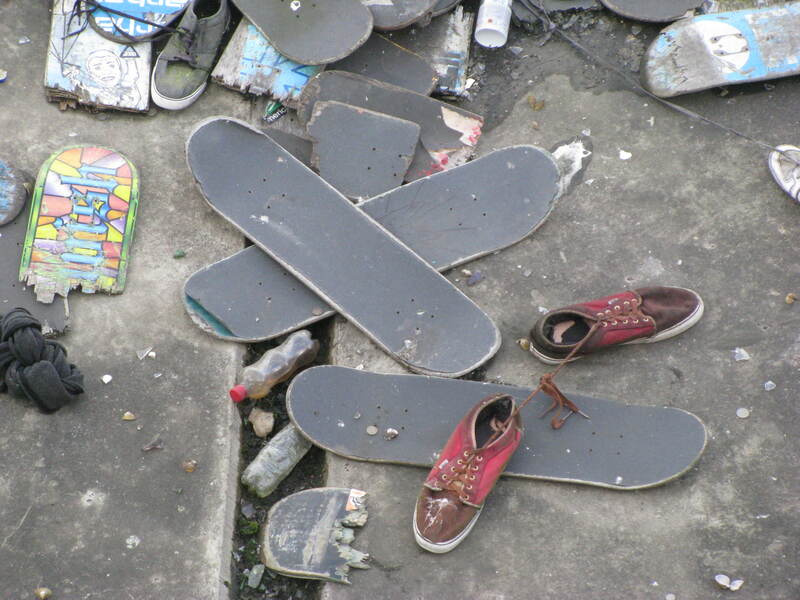 so how good of a skateboarder were you ? Ha! 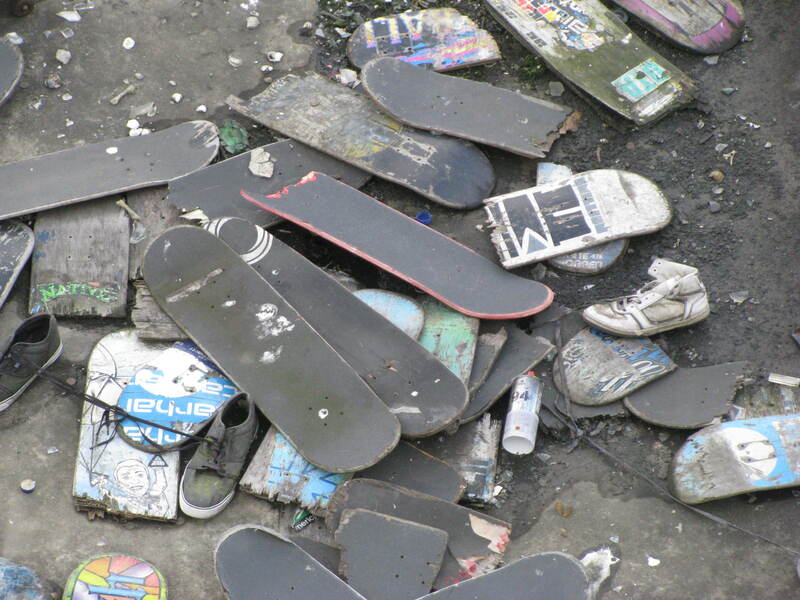 I owned a skateboard since every kid in California had to. 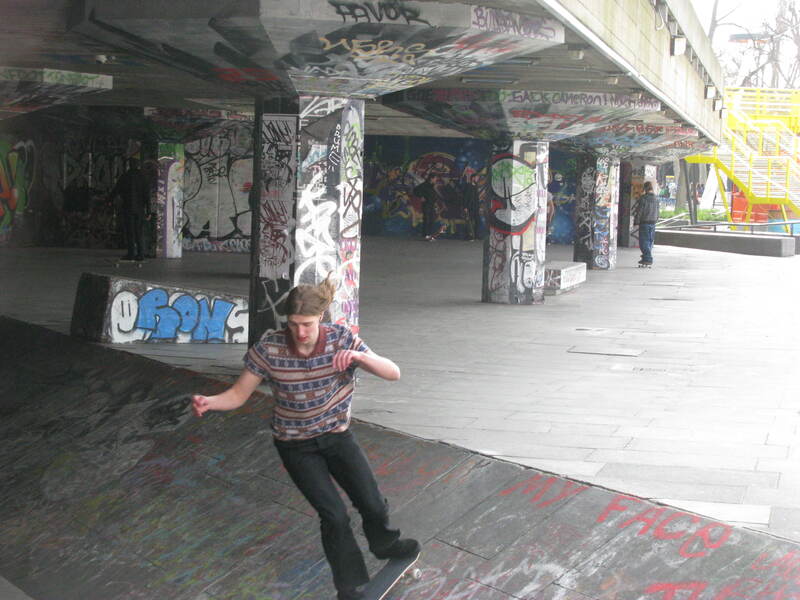 I could do simple tricks, but no, I wasn’t that good. 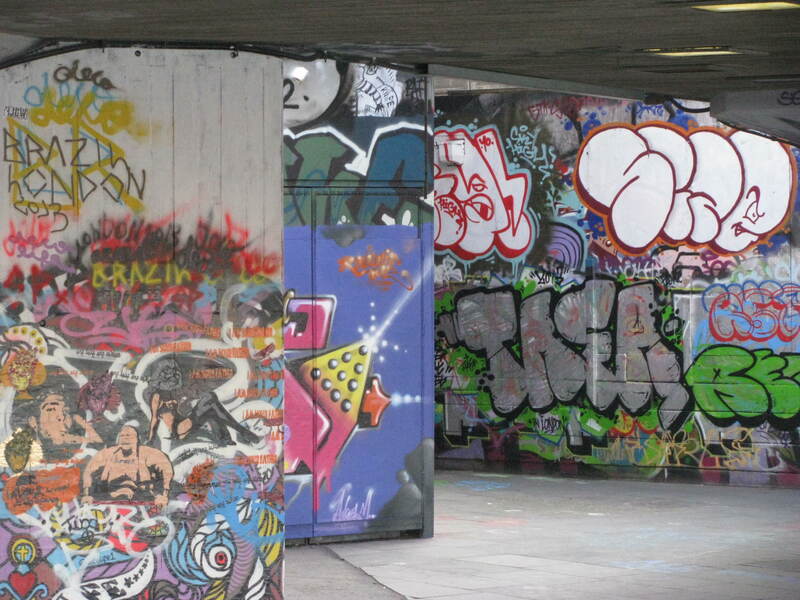 Wonderful grafitti, is this your weekly photo challenge: lunchtime? I guess it could have been, but I didn’t think of it. It was during my Thursday lunch break. And I didn’t use my cell phone for the photos. Don’t think that matters though. This is just like me – I love traveling and observing people around me! It’s so much fun to just open your eyes and to see what is actually happening around you. So often we are so busy getting from point A to point B and forget to look. 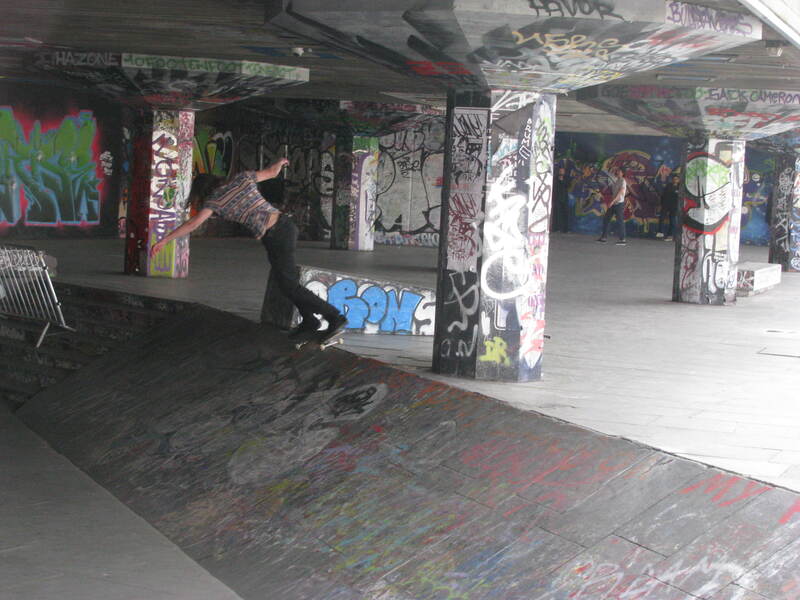 what a jolly jaunt … gorgeous sky and scenery, and glad you took us in to the skateboarders world too! I enjoyed watching them. they weren’t too excited that I was, but they were friendly enough. It would make me nervous and I would probably fall down. I enjoyed seeing the unusual! That couch, although nicely sculpted, probably isn’t as soft and comfy as it looks. Not sure I would want to sit on it 😉 It has a nice view though. Cool shots! 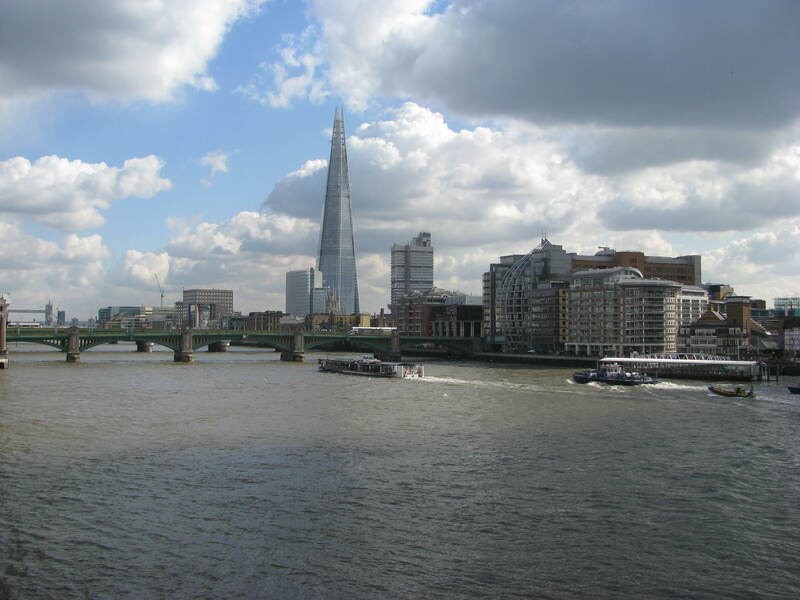 I wish I were strolling with you on a London day….Haven’t seen the Shard. What do you think of it? The architecture, that is? 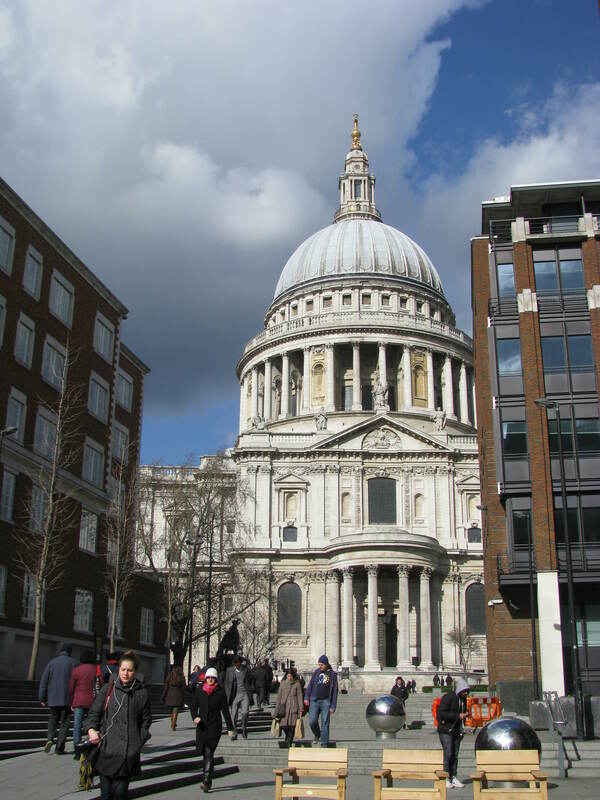 I love St. Paul’s…. At first I didn’t like the Shard, but I have to admit it’s starting to grow on me. Not sure what I like about it, but one of the things about London I like is the mix of the old and new. a lot of times I find myself staring. I haven’t been inside or to the top yet. I hear the views are great, but it costs over 20 quid to get in. Not sure I want to pay that much. It adds to the neighborhood in my opinion. Not a fan of people who just tag buildings and have no skill or creativity. lol…..it looked like this was kind of a secluded area and hopefully, not too detrimental to the rest of the neighborhood…I’m not a fan of tagging buildings and walls, etc…gosh I’m rambling…but I think they should set up areas where these “artists” can express themselves…leave it up for a week, then cover it up and let them start again..
That’s a great idea and I think true art/graffiti adds to the city. So many artists are talented and need a way to showcase their art, especially during these difficult economic times. They add color, frivolity, and create conversations. Can’t imagine a world without art. 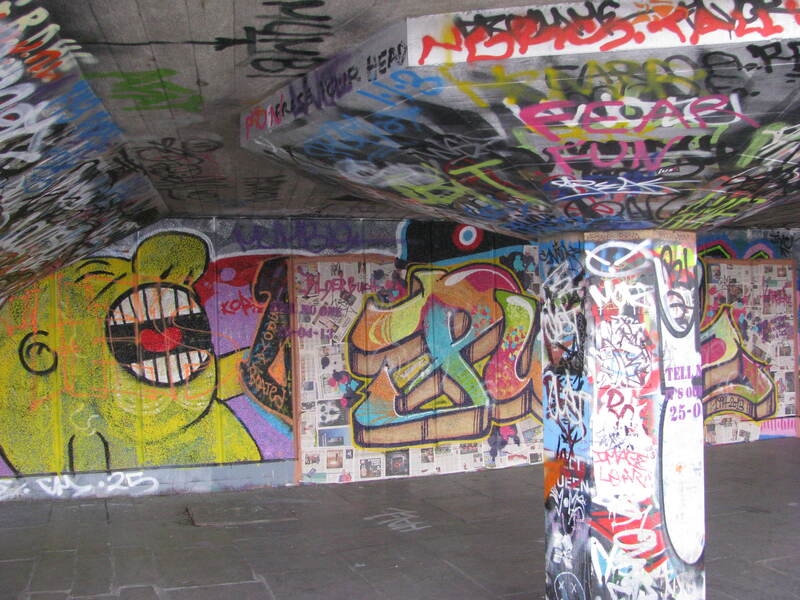 Love the pictures; especially the graffiti!! Next time if the skaters aren’t there I would like to take a closer look. Ok love the sand couch!!! All those books! I probably would have spent hours browsing there. You had a lot of willpower not to buy anything. I’m currently on a self-imposed moratorium on buying books. I just can’t fit one more on my shelves! My problem is that I own so many books that I haven’t read yet. And I’m trying to save money for more travel. It’s hard though. I feel like I need a 12 step program. I wish you luck! I am soooo proud of you!!! You passed up all of those beautiful books! My heart started racing just looking at the pictures :). On our way home from down south, we stopped in to meet a fellow blogger, Dor, in Virginia (not sure if you follow her or not), and she gave me a pile of books she was going to donate to the library. It was awesome to meet one of my blogging friends in person and to get free books at the same time :). Hopefully, we will get to meet next year!! Wouldn’t that be awesome? Yes it would and feel free to bring me as many books as you want 😉 I hope you had a lovely vacation and are home safe and sound. Don’t you love getting back into the swing of things. Good luck editing the story. How long have you been doing that? I knew about the book reviews. This is actually my first one. YIKES!! It was supposed to be more like a polishing second edit which would have been fine for me to do since I’m not an editor by trade, but the author changed a lot and added more, and it now appears like it is going to be a major job. Oh well, I’m very picky about errors and I have great attention to detail, so hopefully I will do ok :). It pays a lot more than the reviewing does – that’s why I bought myself that new ereader/tablet – I was spending the money before I get it LOL!!! Yikes, a little more than you bargained for. But I know you can do it! Thanks! I needed that vote of confidence :). Watch out! 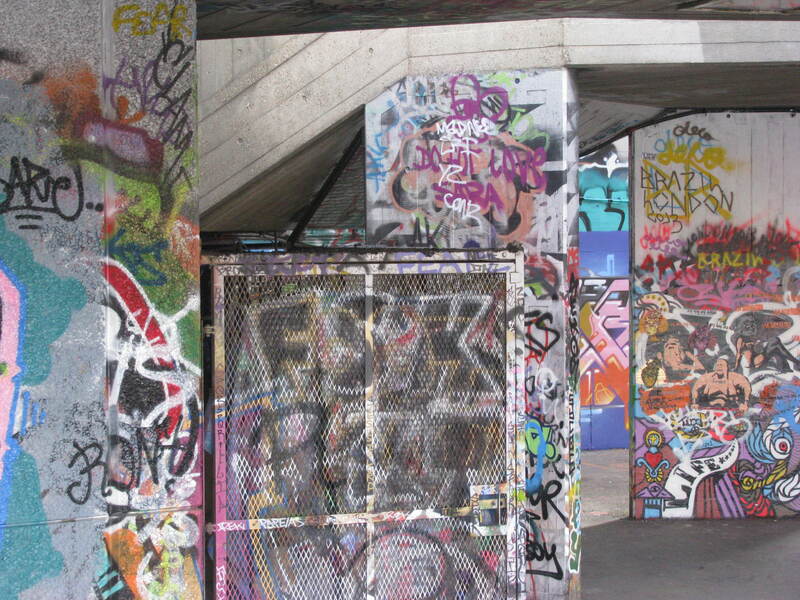 You risk being as addicted to walking along the South bank, especailly in summer, as i am! It’s a lovely place to stroll! 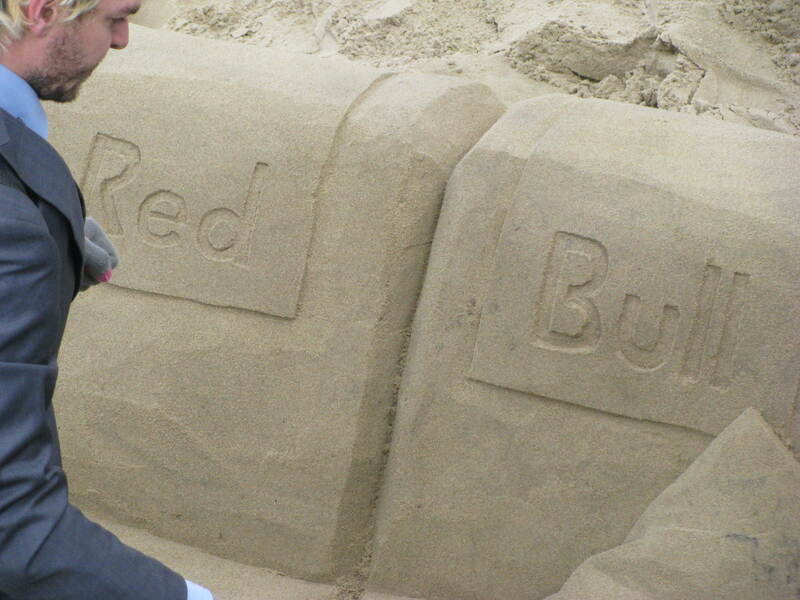 Oh and Red Bull, they do a lot of sponsorship so this person will probably be featured on their site. Interesting. I wonder how long it took him to create this. Not too long or he tide would have turned. I wondered about that. The couch is probably gone by now–at last not intact. I shouldn’t have expoected it to survive one tide. I think that’s safe to say. Have you been by there lately? Yes, I was there briefly on Saturday. How about you? I was near Hyde Park on Saturday–that’s a lot closer to us, especially on a windy day. 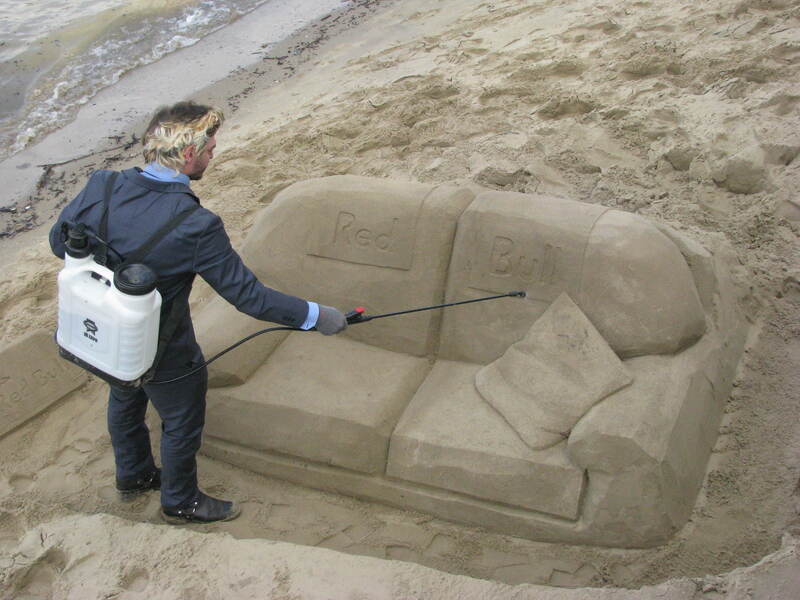 Interesting Findings…I like the sand couch, looks comfy. It was hard to pass up the books. Great stroll of uncommon sites. You are right many cities have more unusual life and sight and it’s not hard to find them. I enjoy seeing the things people usually miss. 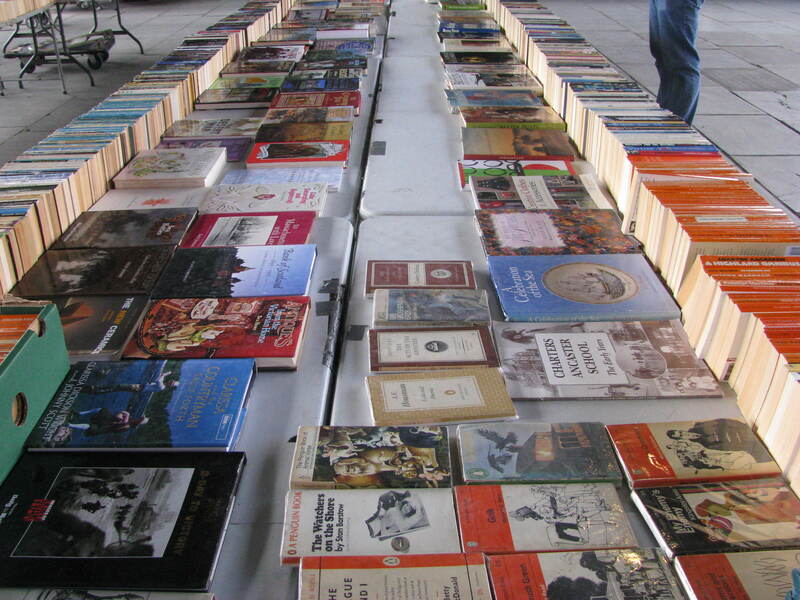 I was drooling over those books! Me too. I’ve purchased books there before and they have a good selection. it’s nice to start my day with a trip to London. Makes it easier to get in my car and head to my real destination. thanks for that!